Both fried and steamed sprouts add flavor and texture to this smoky, lemony brussels sprouts risotto. ……until I offered (forced them to let me) to host Christmas Eve. The CHAOS THAT HAS ENSUED. I just.can’t.even. And most of it because everyone (specifically/only my mother) HAS to have her seven fishes. Not that we’ve ever had them before in the history of my recollection, but just because I am now hosting, they have become non-negotiable. 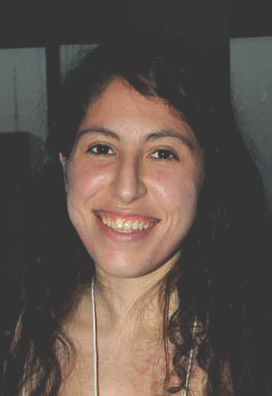 Well, unfortunately for her, I will likely not be conceding on this point, BUT she can always live vicariously through my blog friends who I have joined forces with to put together a Feast of the Seven Fishes Menu worth writing home about!! Half of you are really excited about this, and the other half are like “huh”? Let me explain. The Feast of the Seven Fishes is the traditional Sicilian menu that is prepared on Christmas Eve. Basically, it’s just seven different fishes prepared a few different ways. 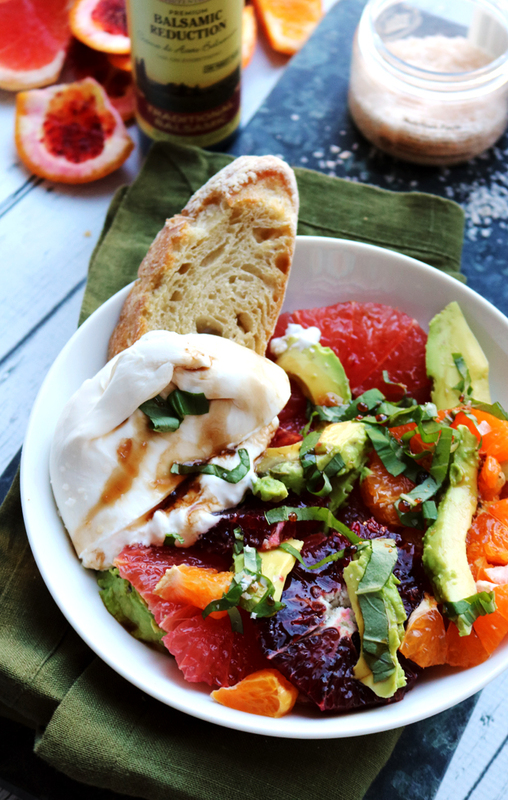 Plus a few side dishes, an aperitiv to cleanse your palate, and dessert. Everything in moderation (except, apparently, moderation). In contrast, the Christmas Eve dinners that I remember from my youth mainly involved my mother freaking out so much about having to host people for Christmas the next day that we were left to eat peanut butter and jelly for dinner while she tried to vacuum around us. I like to think this brussels sprouts risotto is a happy medium, not to mention a fabulous addition to a Feast of the Seven Fishes meal, if you’re so inclined to go that route. It’s fancy enough to stand on it’s own for a holiday dinner, but it’s light lemony flavor also lets the other components of this menu shine. See below for the recipe as well as the rest of the Feast of the Seven Fishes menu that we have put together! Brought to America from Southern Italy where it is all now but forgotten, the Feast of the Seven Fishes is a meal eaten by Italian-Americans that features (at least) seven fish/seafood dishes. 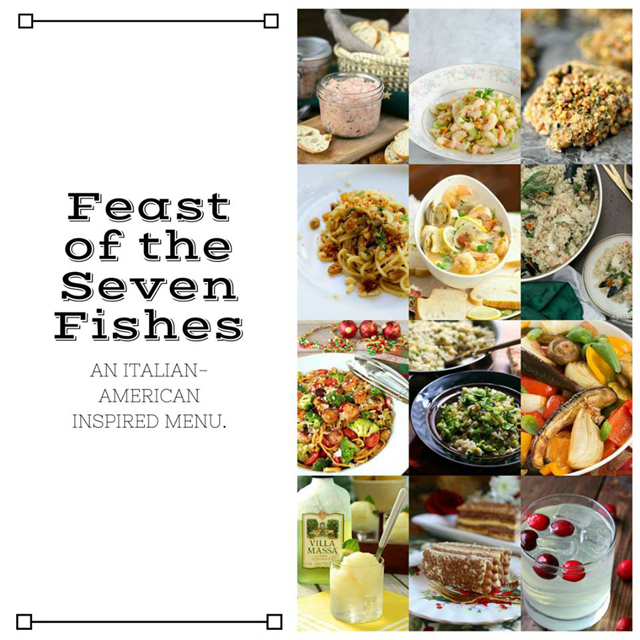 Along with our hosts, Heather from All Roads Lead to the Kitchen and Lora from Savoring Italy, some bloggers have gotten together to share menu ideas for your Seven Fishes feast. Along with the traditional seven fish and seafood dishes, we’ve included some side dishes, a palate cleanser, a dessert, and a cocktail. Put the butter and olive oil in a large saute pan over medium-high heat. Add the onions and fry for 10 minutes, until soft and tender, stirring occasionally. Add the garlic and cook for another minute, until fragrant. Add the rice and shredded sprouts to the pan. Cook for a minute, stirring constantly, until toasted. Pour in the wine and let it simmer for a minute, scraping up any browned bits on the bottom of the pan. Add in the broth, 1 cup at a time, adding the next cup only when the previous has almost evaporated. Stir frequently. Continue until the rice is cooked and all the broth is used up. While the rice is cooking, pour the sunflower oil into a large cast-iron skillet. Place ove rhigh heat. When the oil is very hot, add the quartered sprouts to it, working in batches. Fry for about a minute, or until golden and crispy. Transfer to a plate lined with paper towels. Repeat with remaining sprouts. To the risotto, add the smoked Gouda and half the fried sprouts. Stir in the lemon juice and season to taste with salt and black pepper. Serve topped with remaining fried sprouts. This MAY be the way I finally turn my brussels sprouts-disliking husband into a believer! 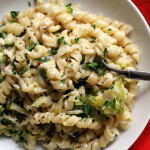 Because he loves risotto (and I love brussels sprouts) – and if I serve them up this way how can he not fall in love? I love this, and I can TOTALLY relate to that story about your mother! I grew up in Malta where the tradtition reads “well we tried…one fish is good enough right?” Thanks for the Christmas Eve inspiration, and good luck on shelf on Friday! Hang in there! This looks amazing! I’ve thought about doing a brussels sprouts risotto before, but I usually just end up roasting them and shoveling them into my face before anything else can be done with them. Oh wow Joanne this risoot looks so creamy – love the gouda and Brussels sprouts combo – this would indeed be a wonderful side to the Feast of the Seven Fishes or even on it’s own! What a great new way to eat my Brussels! Love this! This risotto is stunning! Good luck with Christmas Eve dinner 🙂 “Everything in moderation (except, apparently, moderation).” made me laugh! I’m still giggling imagining your mom getting ready for Christmas and you guys having to eat PB&J. My kids are usually having some sort of a quick bite when I’m doing a big holiday prep. 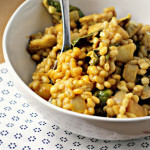 Love the idea of a Brussels sprout risotto. I think it’s a nice addition to all the seafood dishes on Christmas Eve. Thank you for being a part of our feast Buon Natale!! I know a lot of people hate brussel sprouts, but with as many vegetable as I dislike, they are not one of them! 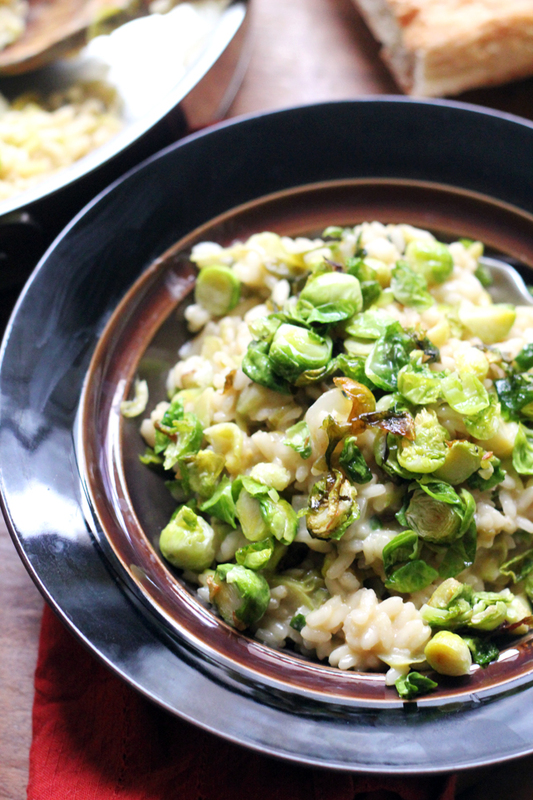 I LOVE brussel sprouts, so I know this risotto would win me over! Thanks for continuing to help keep the tradition of the Christmas Eve Feast alive! What a gorgeous dish! Can’t wait to try it. Ha ha, I love your Christmas Eve memories! My dad was assigned to take us out on an “adventure” to give my mom some time alone. The 4 sisters and dog would hike in the freezing cold till my dad couldn’t stand another minute of bickering! My mom would usually serve us oyster stew, but that wouldn’t fly with my picky husband. He won’t eat Brussels sprouts either, but I think I could live off your fabulous risotto! Merry Christmas!!! I adore that you paired brussels sprouts with risotto. What a gorgeous dish for Christmas Eve. You’re not going to make all of this for your family Christmas Eve??!! 🙂 Kidding! I think you need to delegate a dish to each of them! 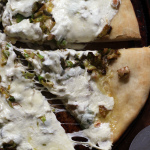 This is such a great way to use brussels sprouts. I think my kids would actually go for it. I have been specifically requested to make brussels sprouts for Christmas Eve! I love risotto but don’t believe I’ve ever had it with Brussels sprouts! I love those too. What a lovely side dish and a nice compliment to all these fish dishes. You are too funny! I remember eating Christmas eve dinner of scrambled eggs with the other little kids on the service porch of our house! P.S. Your risotto is stunningly gorgeous! This risotto looks so good! And brussels sprouts as the main ingredient?! Perfect! Creative risotto! I love brussels sprouts so I’d enjoy this a lot! 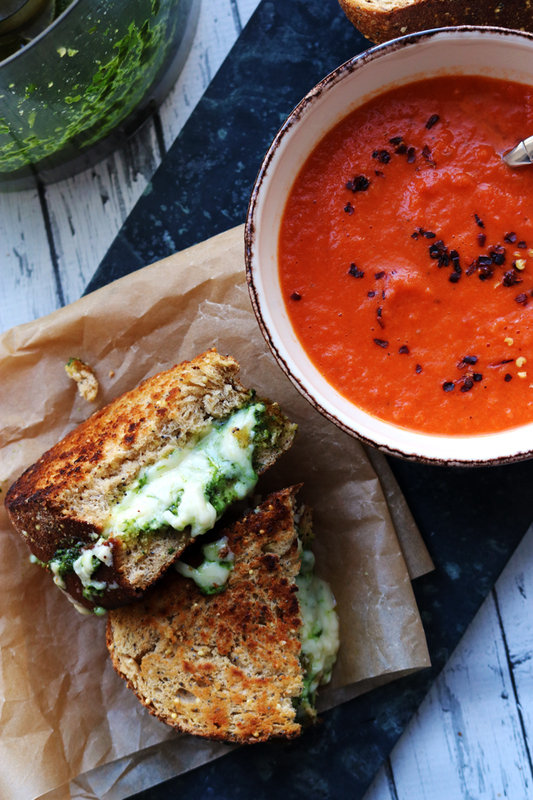 This looks fantastic and is a great reminder that I need to cook from Plenty More. Excited to try this. 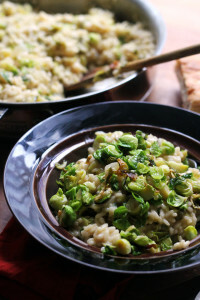 I am dying over this brussels sprout risotto I love how you prepared the sprouts! I don’t think I’d be able to do the seven fishes that just seems like way too much. I can’t wait to look at the rest of the things that everything sounds amazing! 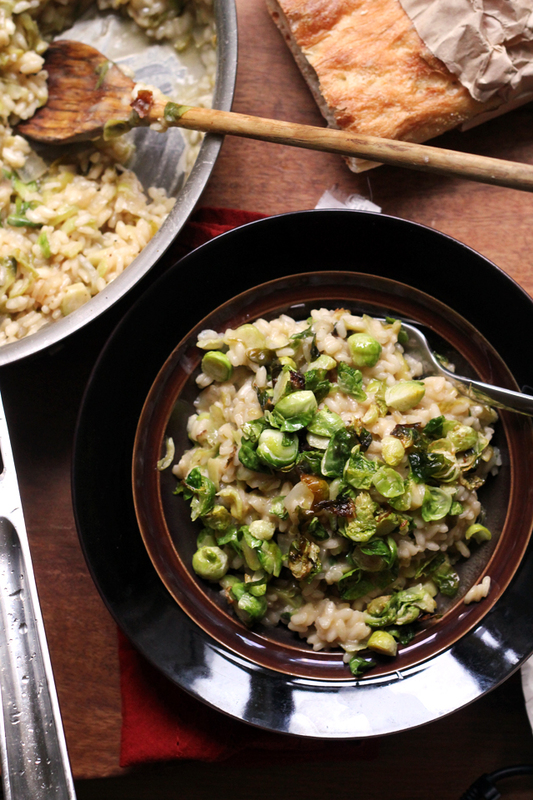 I would gladly forego the Feast of the Seven Fishes for this Brussels sprout risotto! In fact, I could slap myself for not thinking about making Brussels sprout risotto before! Seriously, where has this been all my life? It looks delicious. Merry Christmas, Joanne! Ohhh, that looks super delicious with all the additions to it my Joanne. Definitely this over anything. I need to make some risotto soon. 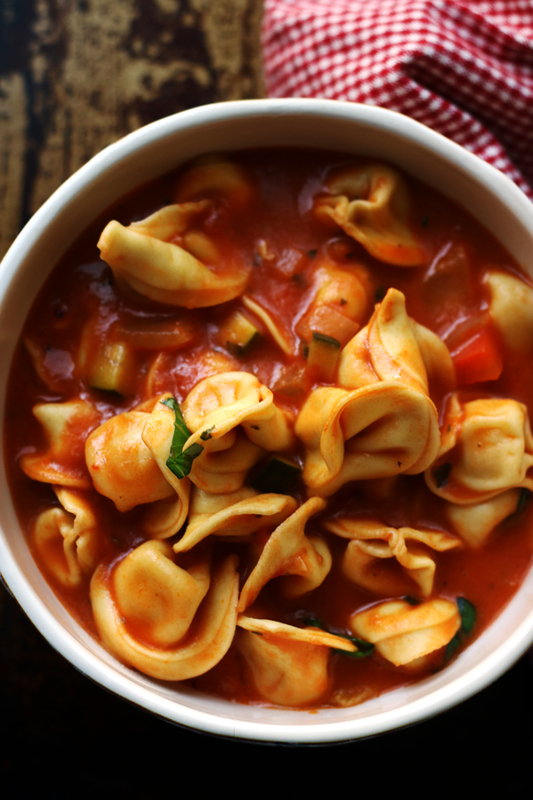 This looks like such a great recipe. Yum! I think this would be a perfect side for the Feast of the Seven Fishes. I hope you have a Merry Christmas. My mom’s folks used to do the whole seven fishes thing, but by the time I was growing up, it had dwindled it angel hair in clam sauce. There are always new traditions to by made! Like soft little sprouts in creamy risotto. I’m kind of embarrassed to admit this, but when I saw this recipe, I let out a little yelp because sprouts just get me *that* excited. This sounds delicious! Also, you are hosting Christmas eve? I couldn’t handle the stress! Moms! We can be such a pain to our poor daughter’s! But I would be happy with just this risotto if my daughter made it for me, it sounds like the perfect side dish! 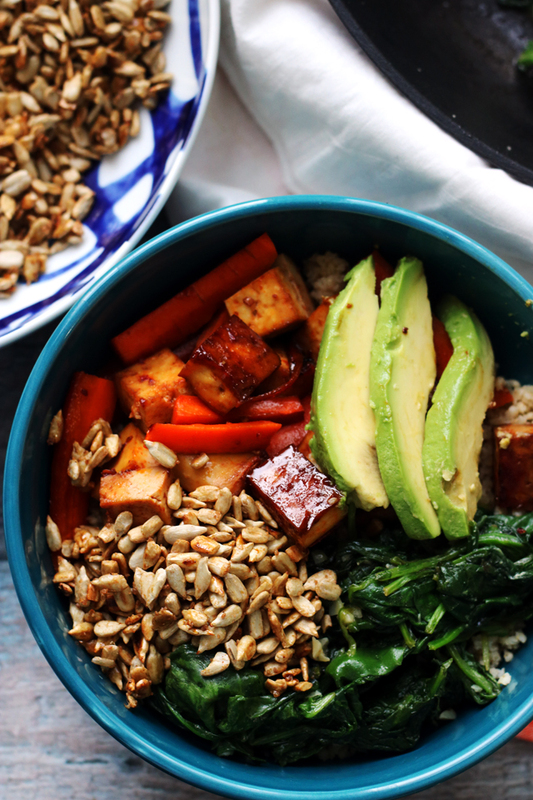 I love Brussels Sprouts so this dish is perfect in my eyes! Happy Holidays to you! I love anything involving brussels sprouts – hope that meal goes well! Merry Christmas, my friend. What a great idea! And now I’ve learned something new 🙂 This risotto looks just perfect! 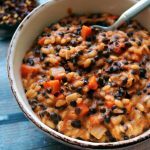 This risotto looks so comforting & delicious! I love anything with brussels sprouts! Hope everything went well with hosting and you had a wonderful Christmas 🙂 Happy holidays! Now THAT’S a brussels sprouts recipe I would eat! Looks delicious! Do you think this would work with frozen Brussels? Thanks for your comment! My only reservation about using frozen brussels sprouts for this would be that they probably are not going to get crispy when you fry them because they’ll be a bit wet. If you want to omit the frying step and just stir them into the risotto, then I think it probably doesn’t make a difference but to really get them crispy, you would have to use fresh.